Dominion Energy Virginia will be offering residential and business customers the opportunity to "go solar" even without investing in solar panels on their rooftops. These customers will be able to have a portion of their energy needs met by community-based solar facilities fed directly into the Dominion Energy grid, according to a release. "Some customers may live in apartments or in other rental properties, or may not be in a position to invest in solar panels," said Paul D. Koonce, president and CEO of Dominion Energy Power Generation. "And for businesses, it may be a matter of not having enough rooftop space or not being in a position to make a large capital investment right now. We have designed a program that will allow these customers to subscribe for some of their energy needs through solar generation." The program is another part of Dominion Energy Virginia's plan to invest $15 billion or more over a five-year period to enhance, protect and strengthen the power grid to reduce outages, further improve reliability and customer service, and make more renewable energy available. For example, the company already has buried more than 650 miles of underground lines in the most outage-prone areas to improve recovery from storm damage. Over the last two years, the company has invested nearly $1 billion to add large-scale universal solar generation serving customers in Virginia and North Carolina. The company has 27 solar facilities totaling 444 megawatts (MW) in operation or under construction in Virginia, up from four projects and 1 megawatt just two years ago. Dominion Energy Virginia's Integrated Resource Plan calls for at least another 5,200 MW of new solar generation by 2042, enough to power 1.3 million homes at peak output. The company also announced last month that it would become the first electric utility in the country to own and operate offshore wind generation. The project will be located off the coast of Virginia Beach. • Allow for the purchase of community-based solar generation for a portion of the customer's energy usage. The Community Solar Pilot Program will enable customers to purchase energy from new solar facilities installed in communities throughout the company's Virginia service area. • Include a 100 percent renewable energy option for 100 percent of the time for residential and small commercial and industrial customers. • Enable a business customer to purchase renewable generation equal to a specific portion of their energy usage. The company will soon seek a request for proposal for solar projects to support these programs. "While program details are being finalized, we want customers to know that we are working on creative solutions to empower them with the best options to go solar," Koonce said. To complement these offerings, the company's existing Green Power Program now has nearly 24,000 customers participating where they can purchase renewable energy certificates for up to 100 percent of their energy use. 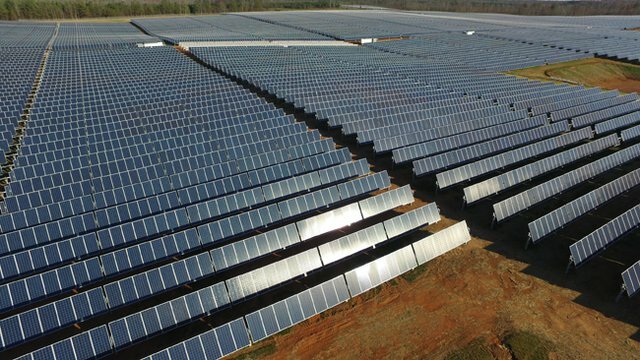 Nationally, Dominion Energy affiliates, including Dominion Energy Virginia, have invested in more than 2,200 MW of large-scale solar facilities since 2013. Dominion Energy's solar fleet is now the sixth largest in the country, among owners of U.S. electric utilities, according to the release.